Cloud computing changes the game. In retail electricity supply costs are under intensifying pressure due to mandated smart metering, new entrants with deep retail capabilities, structural cost advantages and the regulatory environment. End customers are demanding new products and services, fuelling service convergence and the entry of new market competitors. In addition regulators are looking increasingly to drive greater energy efficiency and competition. The current gradual, yet steady progress of cloud adoption will accelerate dramatically over the coming years as utilities become energised and invigorated by the benefits cloud can deliver. As the momentum of cloud adoption grows, those players that move earliest to assess and seize the cloud opportunity will likely seize the initiative from their competitors, by adjusting faster and more fully to the imperatives of the new environment. Cloud computing is a proven model for providing and sourcing IT hardware and software services on a pay-per-use basis using Internet technologies. Cloud services are highly configurable, adaptable and scalable, and require less up-front investment and ongoing operating expenditure than traditional IT models. By shifting the emphasis from fixed to variable costs through pay-per-use pricing, cloud helps utilities align their costs more closely with business need and revenues, as well as supporting continuous cost improvement over time through greater automation and flexibility. Cloud’s effectively infinite processing power and high scalability can also help utilities reduce costs. The inherent characteristics of cloud computing provides utilities with an effective platform to support future high performance, growth and industry change. These factors are why we believe cloud will fundamentally change the game for utilities in the next few years. The utilities industry will continue to change, and cloud computing will help shape the new rules. Utilities that have not yet taken their first steps toward their cloud-enabled future should make it a priority to examine the potential of cloud computing—and also take a close look at what their competitors are doing in this space. 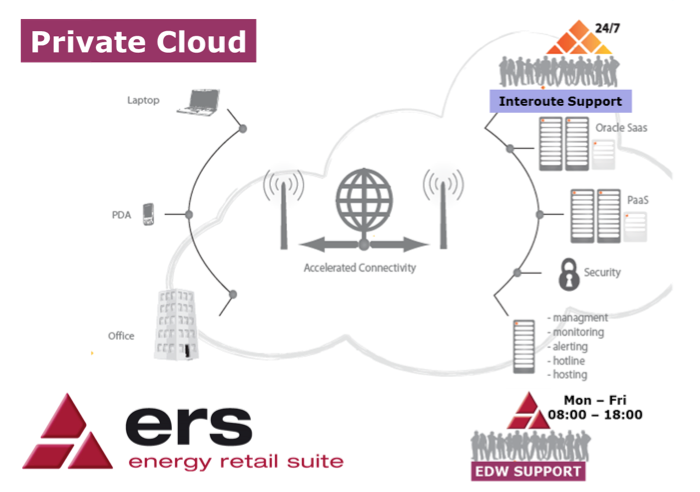 The EDW Technology Limited (EDW) Cloud Host Service (CHS) enables the rapid deployment of the Energy Retail Suite (ERS) reducing the investment required in hardware and network infrastructure, and most importantly, enabling rapid retail electricity market entry. Designed to significantly reduce barriers to the electricity market entry, CHS reduces up-front capital investment in hardware/networking and provides access to IT and industry expertise required to rapidly grow a sustainable electricity retail supply business. CHS provides the perfect technical incubator for your new retail electricity business, enabling you to focus on non-technical business start-up and development activities, supported from day one by an enterprise-class IT solution. EDW's IaaS is a flexible Cloud offerings which provides organisations with a mechanism to take advantage of hardware and other physical resources without any capital investment or physical administrative requirements. The EDW CHS provides 24/7 infrastructure support with a resilient platform across two data centres. - Help desk Mon – Fri 08:00 to 18:00. EDW has partnered with Interoute, a Gartner 'Leader' organisation and ranked in the top 25 Global Cloud Providers, in order to provide the best service possible to our customers. Interoute is the owner/operator of Europe's most advanced and densely connected voice and data network. Their Unified ICT strategy and Managed Enterprise Cloud platform makes them an ideal partner in the delivery of our business critical ERS application. Blending their industry leading support, enterprise managed cloud and global reach into EDW’s own portfolio provides a market leading offering for our customers. The Interoute platform has been designed to facilitate the high demands of enterprise applications and the large data volumes generated by an electricity retail supply business. Interoute is a robust, virtualised infrastructure spanning multiple UK data centres (Tier III & IV), and brings together best of breed vendors including Oracle, Microsoft, VMware, NetApp and HP to provide a true enterprise class platform. Interoute are responsible for the management, provisioning and availability of all resources and systems up to the ERS application layer, allowing EDW to focus our efforts in application development, delivery and support. All systems and data reside in the UK. On that basis, only UK legislation applies and you are not subject to the US Patriot Act or any other foreign regulation. Primary systems are delivered from Derby with a mirrored failover infrastructure in London. The Interoute platform has been provided to EDW customers with 24x7 managed delivery and support, alongside a guaranteed availability SLA of 99.9%. All servers in the Interoute cloud are backed up on a nightly basis and stored offsite from the primary site in their secondary datacentre. The backup schedule is 7x daily, 8x weekly, 6x monthly, 4x quarterly and 1x annually. Interoute’s business continuity management plan incorporates a rigorous testing procedure for information assets. Interoute simulates multiple system failovers on a monthly basis, success or failure of these tests are documented as part of their ISO20000 accreditation. The Interoute platform has 4 10Gb connections into Tier 1 transit providers. The connections are spread across 3 PoPs (Telehouse North in London, Global Switch in London and Telecity in Manchester) to provide geographic and carrier diversity. Carrier selection is via MPLS routing. MPLS routing ensures continuation of service, with sub-second failover, in the event of a single link being down. There are no single points of failure in the entire Interoute platform, from connectivity through switching and into infrastructure; this is additionally across two datacentres therefore covering a geographic perspective also. All software licenses that underpin the service are based on service provider licensing agreements with agreements containing the necessary EULA amendments for hosting, so that you can be sure you are compliant. The Interoute platform has been built and managed with the highest standards of security. Interoute deliver two factor authentication as standard and core security includes best of breed AV, encryption, Firewalling, VPN, 2FA, IDP & NAC. Where required, additional security levels are available to include Data Leakage Prevention, Content Filtering, Application Firewalling, Security Event Management and Vulnerability testing. Their managed services can also be overlaid to provide patching and penetration testing services. 24x7 real-time monitoring is in place to monitor server health, infrastructure status, replication & backup success, alongside a host of metrics logged and analysed against database and operating system to ensure an optimum user experience when using the ERS applications. Interoute recognises that discrete analysis of security events is not enough to properly detect threats in the continually advancing world of internet security. To combat this, the Interoute platform makes use of an advanced Security Information and Event Management (SIEM) solution based on the Juniper Security Threat Response Manager (STRM) platform. The STRM Series was developed to provide an integrated approach to threat management that combines the use of traditionally silo’d information to more effectively detect and manage today’s complex threats. Additionally the Intrusion Detection System (IDS) module on the Interoute perimeter firewall array gives a double layer of intrusion detection. These devices generate daily reports and are subject to audit logging as part of Interoute’s ISO 27001 certification. Interoute performs quarterly vulnerability assessments of their cloud management infrastructure as required by our ISMS (Information Security Management System) and in line with ISO 27001. A certified ethical hacker carries out the assessment and pending the outcome of the scan will suggest whether further testing may be required. Interoute also operate an internal vulnerability assessment procedure on a quarterly basis, this internal assessment is carried out by default when provisioning a new customer to ensure the integrity and isolation of the environment. From a platform perspective, the solution has no limits and is completely scalable with your use of the service and the growth of your electricity retail business. Interoute is the owner/operator of Europe's most advanced and densely connected voice and data network, encompassing over 60,000 km of lit fibre, 8 Data Centres, 32 purpose-built colocation centres and on-net to another 150 partner Data Centres across the European footprint. Interoute's Unified Computing portfolio assists organisations to reallocate budget from maintenance to transformation; bolstering ICT efforts to deliver increasingly revenue based services while maintaining operational value for money. Component/physical node failure = automatic reboot <1 minute with zero disk data loss. DC1→DC2 target failover <1hr with full IP/DNS failover – no client or end user interaction required. The backup schedule is 7x daily, 8x weekly, 6x monthly, 4x quarterly and 1x annually. Instant Recovery available with full performance requiring an outage during an agreed maintenance window. Database level Standard or Advanced Backup Services are included as a Managed Service. Point In Time and Ultra Fast Recovery options available in ABS. Cloud Computing is a growing theme and will become a predominate method of delivering computing services going forward. Cloud Computing is a paradigm shift that sees the dawn of a new age of computing driven by distinct benefits. Given the undeniable value to be gained from a Cloud Computing solution, it is hardly surprising that many organisations are contemplating a shift “to the Clouds”.